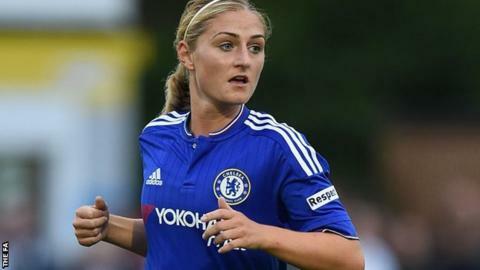 Chelsea Ladies midfielder Laura Coombs says Sunday's Continental Cup quarter-final is equally as important as their final two league games of the season. The league leaders, who are two points clear at the top, travel to Birmingham City in the last eight of the cup. Having already won the FA Cup, Chelsea are bidding for a domestic treble. "Our manager has made that really clear to us. We want to go for all three and go as far as we can in the Champions League," Coombs, 24, told BBC Sport. Chelsea have never won the Continental Cup, reaching the semi-finals for the first time last season before losing to eventual-winners Manchester City. But Coombs says the positive mood among the Blues squad has been further lifted by senior England call-ups for five of her team-mates. "I'm massively pleased for them all, and especially Gilly (Flaherty)," added Coombs. "It is so well deserved. She is one of the leading centre-backs. "She's shown she can score goals too. She's the perfect centre-back." Flaherty, who scored what proved to be the winner in last Sunday's 2-1 win over Notts County, was named in the England squad alongside Chelsea's Claire Rafferty, Eniola Aluko, Fran Kirby and Gemma Davison.